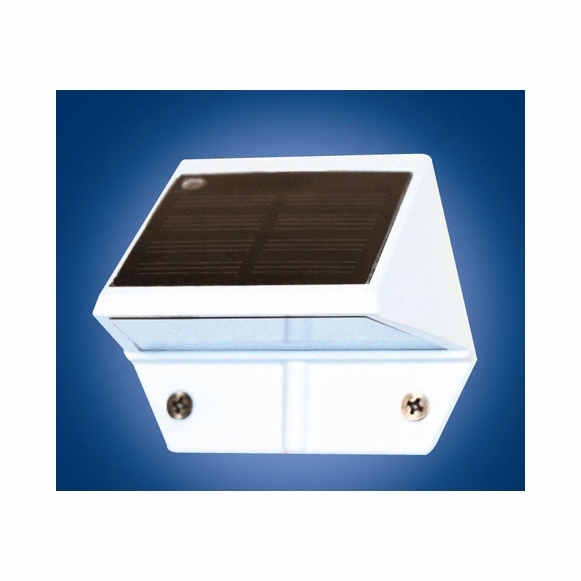 Our popular solar light is used for house number signs, mailboxes, decks, walls, posts, and many other purposes. Also known as a solar wedge, it stays lit for up to 12 hours. Lights up automatically every night and can also be turned off. Mount over your address plaque, as shown in right most small image above, for nighttime visibility, or use it on your mailbox as a solar mailbox address light. Often used to light decks and other outdoor areas. Two high-output LEDs produce brilliant white light. Runs on one long life AA Ni-Mh rechargeable battery (included). 3.5" x 3". Finishes: electroplated copper, black powder-coated aluminum, white powder-coated aluminum. Best price for these solar lights on the web! They are small but give off good amount of light and stay lit up all night long. Couldn't believe it! Most solar products I've tried get dimmer and dimmer as the night goes on and turn off after a few hours. This little light lasts ALL night.